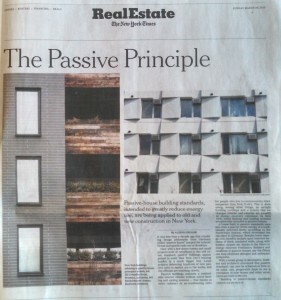 New York City’s rapid embrace of the Passive House Standard for comfort, health, and energy efficiency made The New York Times cover story in its Real Estate section on Sunday, March 29, 2015. Duncan Architect is the Passive House consultant for a senior residence with a pre-K on the ground floor. This project is one of those featured in the Times article. A social services organization, the Hellenic American Neighborhood Action Committee or Hanac, has also jumped on the passive-construction bandwagon for its eight-story 68-unit senior housing development, to be completed in Queens in summer 2017, said John Napolitano, Hanac’s director of community development and planning. Part of the allure of passive house is the ability to withstand some of the effects of power cuts, he said. NY Passive House (NYPH) is particularly proud of this article because it features a range of work by NYPH members, including: Stephen Lynch of Caliper Studio, 255 Columbia Street by Ben Igoe of JBS Project Management & Sam Bargetz of LoadingDock5, Steve Bluestone of the Bluestone Organization, HANAC senior housing with consulting by Greg Duncan of Duncan Architect, and Michael Ingui of Baxt Ingui Architects. and followed up with more information about the upcoming conferences in Germany and New York City. Greg Duncan will be going to the International Passive House Conference in Leipzig, Germany on April 16 and the New York Passive House Conference on June 11. Duncan Architect is glad to be able to help people jump on the “passive-construction bandwagon,” especially on a project like the HANAC senior housing that will be such a benefit to the community in Corona, Queens.